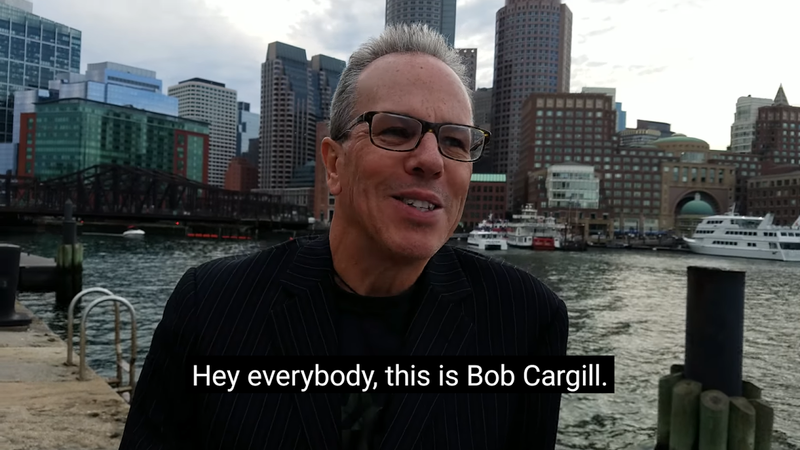 Bob Cargill’s podcast, “Bob Cargill’s Marketing Show,” is a series of commentaries and conversations on the trends, developments, topics and issues that are on the minds of marketers, advertisers, social media and PR professionals today. It was a pleasure to speak with chef Jordan Mackey - who will soon be reopening what was formerly known as the restaurant, 29 Sudbury, as Twenty-Nine Rustic Mediterranean - along with marketing consultant, Elizabeth Rose, and investor, Scott Myles. I met Kate last year at a marketing conference in Boston after having seen her on Twitter as @BankSmartKATE. I've been very happy to be able to stay in touch with her ever since, especially knowing how much we have in common from social media to running to both being graduates of Framingham's Leadership MetroWest. This social media marketing maven got her start with her own fashion and event blog. After working as a freelancer and agency, she moved on to the financial marketing life at Avidia Bank. Kate isn’t limited to marketing and banking. Kate is a lover of music and IPAs, so you may have even heard that she coordinated a beer collaboration between Avidia Bank and a local brewery which was launched at a music festival! Her quest is to find ways she can make Avidia stand out in the market, usually through a long, thought out PR Stunt. You can follow her on Twitter and Instagram at @BankSmartKATE. I met Jeffrey just a few months ago through a mutual friend of ours - thanks, Lysa - in Hudson, Massachusetts. We have done a little volunteering together for a local nonprofit organization and we both have "residencies" in our respective areas of expertise at a new co-working facility in Hudson called Out of Office. Jeffrey Gordon had been working in the corporate world for over 10 years and was was looking for a more satisfying career. After lots of thought and discussion with his wife, Krista, Jeff decided to take the risk of starting his own company, Ideal Video Strategies. His desire to make a difference in people’s lives and be more active in his community has spearheaded this undertaking. Jeff has a Master’s Degree in Education Media Design from Full Sail University and a Bachelor’s Degree in Digital Recording Arts from New England Institute of Technology. He is a certified expert in Adobe Premiere Pro and has won multiple Telly Awards and AVA Digital Awards for his work. When not working, Jeff enjoys spending time with his wife and two young kids, Caitlyn and Alex. They keep him pretty busy! He also likes to spend time in his gardens, growing flowers and vegetables. He considers himself to have a very green thumb! If you think you define your own brand, think again. Your customers, clients and connections define your brand. They say what your brand is, not you. Do you not just talk the talk, but walk the walk, too? The best brands among us live, breathe, work and play what they say they are day in and day out, time and time again. They don’t rest on their laurels. They don’t ever stop evolving. They listen to their audience’s feedback and don’t just meet but exceed their expectations. Whatever they have to offer – products, services, advice, support, you name it – is always more than appreciated by those on the receiving end. P.S. How can I help YOU? Branding. Social media. Copywriting. Content. You name it. Please don't hesitate to reach out to me at Cargill123@gmail.com. Anytime. Episode 59 - Are You a Hyperleader? Do you know someone who is a hyperleader? I heard about this term for the first time in an article I read recently by Paolo Gerbaudo for the New Statesman ("The age of the hyperleader: when political leadership meets social media celebrity" https://www.newstatesman.com/politics/media/2019/03/age-hyperleader-when-political-leadership-meets-social-media-celebrity). Paolo uses the term in referring to certain types of politicians who may be more popular than the parties they represent and are particularly adept at using social media to engage with their constituents. I’m using the term in referring to people you and I may know in the business world. These are people who can be game-changers. They can single-handedly attract more attention to the brands and businesses they represent than those entities can themselves. These are people you want on your side. These are people you want working on your behalf. I've known Jamie for a long time, as our paths have crossed regularly over the years at Boston-area marketing events. We're both experienced veterans in the industry and big believers in time-tested, traditional business principles, but we are also proponents of digital marketing and early adopters of social media. Jamie has spent over 30 years working with organizations to produce communications materials, starting in 1977 as an entry level graphic designer for the daily newspaper at the University of Massachusetts Amherst. Having spent many years as an account executive for various web and sheet fed printing companies selling their limited capabilities, he moved into outsourced print management services so he could more effectively address the individual needs of his clients. This included positions at companies that also produced embroidered apparel and promotional products, where he developed Print On Demand web sites and branded Company Web Stores. Jamie has been the winner of both regional and international printing awards, has been published in various business journals and newsletters, and invited to speak before industry events, college design students and corporate marketers on printing technologies. The springboard for this episode with author, Jill. C. Baker, was her Sutherland Series books, each of which is centered (according to Jill's website http://jillcbakerauthor.com/) "around the family of Sarah Sutherland - an average woman, a working mom, someone not too different from most of us - other than in her ability to transcend time." In this conversation, we talk about what has gone into the writing of these books - characterized, again, according to Jill's website, as "historical fiction with a touch of paranormal" - as well as the marketing of them, including the use of social media. Jill takes us behind-the-scenes of her publishing process, sharing a number of great tips and anecdotes that will interest anyone who wants to see their own book to fruition. She also talks candidly about how much she has learned herself as a new author and the unique challenges of promoting her own work. Later in our chat, we are joined by our mutual friend, Scott Myles, who has a lot to say about what Jill has written so far as a reader and, yes, fan. Thanks, Scott, for adding so many good points to our discussion, including a number of tips and suggestions for increasing Jill's book sales. And, of course, thank you, Jill! I know both Jill and Scott, by the way, from a networking group I co-founded in Sudbury (MA) nearly eight years ago with Phil Hollows called the Sudbury Social Tweetup, a monthly event for those interested in social media and marketing. Don’t be a one-trick pony on social media. Unless it’s the only place your audience can be found, don’t spend an inordinate amount of time on just one channel at the expense of others. LinkedIn, Twitter, Facebook, Instagram, YouTube, etc.…you want to be working the crowd in a multitude of places. You want to be diversifying your efforts. Once you've tested and learned where you get the biggest bang for your buck, you want to focus there, of course. But you don’t want to overlook the importance of having a presence elsewhere at the same time. You never know where you’re going to get the most traction down the road. You may think you’re getting good results where you are now, but you have no idea how many opportunities you could be missing elsewhere. Don't be satisfied with success on just one channel. Don't give short shrift to your options. Check in with your customers, clients, colleagues, connections and constituents. Check in with your friends and family, even complete strangers. I recently had a ridiculously awesome breakfast at J&M Diner in Framingham, Massachusetts, with my wife, Barbara, my sister, Cathy, and my mom. What’s written on that sign is something ALL businesses and brands should heed. All of us should be checking in with our tables, so to speak, in both our professional and personal lives. We should always be asking people around us how they are doing and if we can help them in any way whatsoever. That would be good for business. That would be good for everyone in so many ways. You. Me. All of us should take a cue from the people who work at J&M Diner and be kind, courteous, helpful and friendly. Hold yourself accountable on social media. Be conspicuous in your presence on LinkedIn, Twitter, Facebook, Instagram, YouTube and the like. Don’t be missing in action. Be alert and attentive, engaging and enlightening. This is not a virtual existence we’re talking about, this is reality. This is where your customers, connections and constituents expect to interact with you. This is where your friends, family, followers and fans look for you. Businesses, brands, you, me…we’re all accountable to one another on social media in 2019 and beyond. If we’re out of sight on social media, we’re out of mind. Don’t be invisible. Don’t be shy. Don’t be indiscernible. Don’t be hush-hush. Share and share alike on social media. Give as much as you take on social media. Hold yourself accountable there.